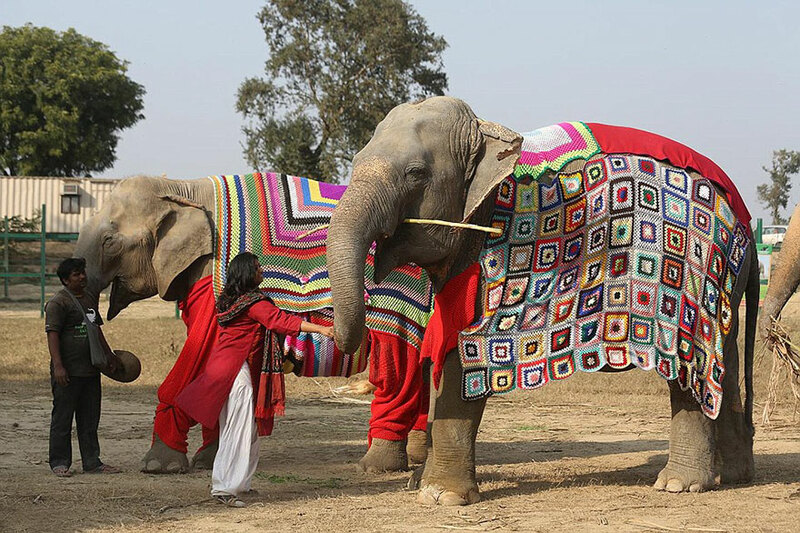 Sweaters for elephants. That’s right, sweaters for elephants. I hope they’re also washable, because elephants love coating themselves with dirt. They look pretty happy about it. I thought maybe you were being sarcastic, then I looked at the picture and those are in fact the happiest-looking elephants I’ve ever seen. Ya, no, not sarcastic at all. I’ve worked with elephants, and those phants in the photo look VERY comfortable – loose, relaxed, having a good time, enjoying the presence of the humans. The guy on the left has got to be one of their regular humans, he wouldn’t be standing in that spot otherwise. It looks as if the phant has her trunk curled around his hand, which is a between-friends kind of thing. I love that the elephants are being cared for. Those giant sweaters are crochet, though, not knitting. I don’t know why it bothers me that the report didn’t bother to learn the proper feminine art that produced those lovely blankets, but it does. Love it… They’re so festive!